What do you get if you take Flashman, remove the streak of yellow from his back and make at least some of the adventures ones entered into knowingly by the participant? Why, you get Brigadier Etienne Gerard, of course! Gerard is a creation of Arthur Conan Doyle, sadly languishing in the shadows with all of his other characters not called "Sherlock Holmes". He is a dashing hussar in Napoleon's Grande Armée who, in his old age, is recalling to the reader the adventures of his youth. The comparison to Flashman is an instructive one, especially in that while Flashman is committed to strictly telling the truth he ultimately becomes more and more a bounder and cad in our eyes, while Gerard (well I certainly won’t call him a liar, but let’s just say he has a spotty memory at best and isn’t the most observant fellow) is a somewhat less than objective reporter, and yet each tale shows him to be a goodhearted man of high ideals. These are tales filled with derring-do, close escapes and not a few romantic entanglements...I think I see where George MacDonald Fraser got at least part of his inspiration from. Gerard is a very likeable character and narrator for all that he is so full of himself that it's a wonder the hot air doesn't make him float away. His voice is urbane and charming and all of his adventures are rousing good tales. At the beginning of each adventure one almost sees the sunlit café table at which we sit and can almost taste the cognac in our coffee as we listen to the Brigadier reminisce. He really is a charming old campaigner, though not exactly the sharpest knife in the drawer. Still, for loyalty and sheer bravado one could do worse than having a Brigadier Gerard in one’s army, for while he “has the thickest head he has also the stoutest heart” of all of Napoleon’s men. I was actually a bit surprised at the very real violence and horror of war hinted at occasionally in these stories. Despite being adventure stories of the Victorian era they don't necessarily shy away from some of the less palatable aspects of their subject matter, even if Gerard tells of them with a very wry nonchalance. I was, for example, a bit surprised by the horrific death of one of Gerard's soldiers, buried alive, as related to him by a bandit chieftain, or the recounting by Gerard of a military tribunal of French POWs who punish a traitor in their midst such that "In the morning, when [the English] came for their man with papers for his release, there was not as much of him left as you could put upon your thumb-nail." 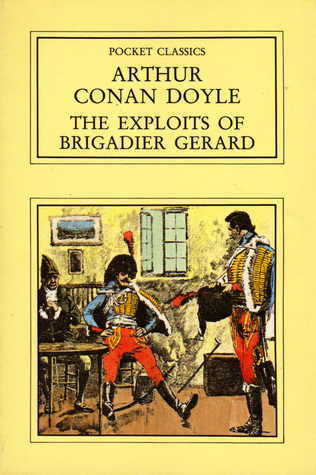 When I started this book in tandem with Doyle’s _The Adventures of Sherlock Holmes_ I was asked which I liked better. I had immediately given the nod to Sherlock Holmes, if only for his iconic and fascinating character, but now I’m not so sure. Holmes is great, but Gerard is very charming indeed and there is not a dud amongst his tales. Doyle has really impressed me with his range in these two creations alone and I look forward to the further adventures of both characters, not to mention a look at some of Doyle’s other fiction. I highly recommend the Gerard stories to anyone interested in historical fiction and adventure, especially when it is tinged with good humour.